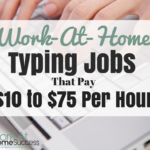 At Work-At-Home Success, you’re going to get all the information you need to understand working at home, tons of ideas on what you can do to make money at home, and resources to turn your work-at-home dream into a reality! Since 1998, Work-At-Home Success has been providing work-at-home jobs, home business ideas and tips, and much more. It’s one of the oldest and most respected work-at-home resources online! And it all started when I was a young mom who wanted to stay home with my kids. 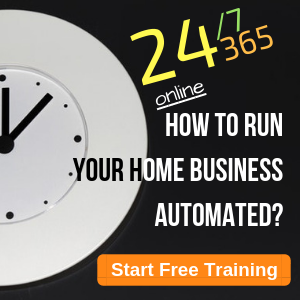 Many believe Work-At-Home Success was the vehicle I used to work from home, but in fact, when I started the site, making money online wasn’t as easy or affordable as it is today. Instead, I worked at home in a variety of jobs and businesses including adoption social worker, business-to-business sales, real estate, direct sales, web master and writer. As online income options became available, I took advantage of those, earning income through affiliate programs, creating my own information products, and authoring books related to working from home. Through my journey, I’ve learned a lot and as a result I have been featured on CNN.com, Fox Business, Redbook, Women’s World and a host of other media outlets. Today, my income is still varied as I enjoy doing so many different things. I still do occasional adoption social work, but mostly I run Work-At-Home Success and Digital Writer Success, write (freelance and books), and speak. 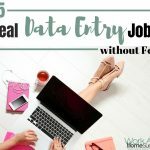 Working at home is so much easier now than when I started, but there are still scams and pitfalls you need to watch out for. I’m committed to providing information and resources to anyone who wants to work at home for free. 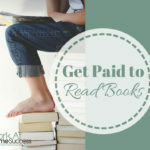 To that end, I continue to run the Work-At-Home Success website, author books related to working at home, and speak on work-at-home related topics. 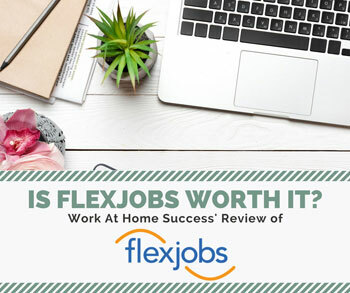 Work-At-Home Success was one of the first work-at-home websites on the Internet particularly in the area of telecommuting. It was one of the first sites to post legitimate work-at-home jobs. 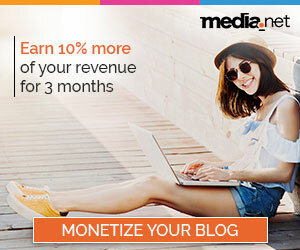 Since its first posting in January 1998, the site has been regularly updated and revamped with the goal of providing the latest news, tips and techniques and ideas on working at home. There are thousands of work-at-home websites on the internet. What makes Work-At-Home Success unique is that the website itself is NOT how I earn my main income. 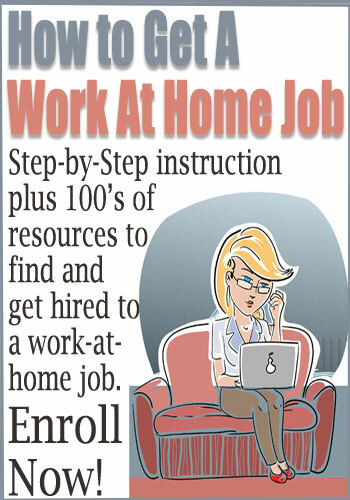 Many work-at-home websites on the Internet are run by people who don’t have previous experience working at home. They provide generic information about working at home and use affiliate programs to earn income. This is not necessarily bad, but they don’t have the experience from which to provide detailed information to their visitors. I believe this can make a difference in the quality of information available. How can they truly answer questions about telecommuting if they haven’t telecommuted? Work-At-Home Success provides information based in real life experiences. 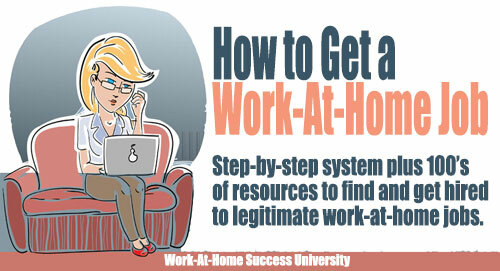 Are you ready to work at home? Here’s what to do next! Sign up for the Work-At-Home Success Newsletter (sign-up form below or to the right)where you’ll get several free goodies plus get jobs and other resources twice a week. 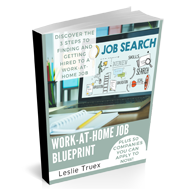 Visit the Get Started page to get all the basics you need to know about working at home (important to avoid scams and not waste time on bad schemed). 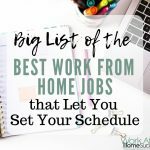 Be sure to follow the steps on the Get Started page to figure out the best work-at-home option for you. Consider following me on social media for updates and other great work-at-home tips and information. I had signed up for your class on tues night,but could only stay to listen for 1/2 of it. You had mentioned that they were going to record it. Did that occur? I would really like to hear the rest of the class so if you have any information where I can hear the recording I would appreciate it very much. It helped me figure out ways to work from home. Excellent!! I’m so glad to hear it. Congratulations on your success!! !